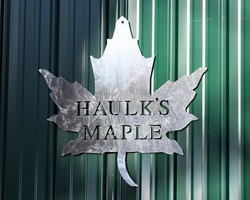 Haulk's Maple is a maple syrup business owned and operated by Robert and Diane Haulk of Madison, Maine. Haulk's Maple started in 2000 with about 250 taps. Today there is a new building (that we call the Sugar House) and we had 2300 taps for the 2012 maple season. Each year we have been expanding with the number of taps, as well as the equipment in the Sugar House. The evaporator is a Leader Vortex 4' x 12' with a max flue pan and revolution front. It is only two years old and can process 300 gallons of sap per hour to produce 7.5 gallons of syrup.